But does it have the X factor? The Alcatel One Touch Idol X is unlikely to find itself draped across billboards nationwide, but it's looking to take on the big guns in the mobile market. The handset sports a sizeable 5-inch FHD IPS display with a full HD, 1920 x 1080 resolution, 1.5GHz quad-core processor, 2GB of RAM, and 13.1MP rear camera meaning it stacks up pretty well against the likes of the HTC One, Samsung Galaxy S4 and Sony Xperia Z. There's a rather paltry 8GB of internal storage included, but there is at least a microSD slot in the One Touch Idol X allowing you to expand on that offering - and with a 2MP front camera and Android 4.2 Jelly Bean there's more good news than bad. A slightly worrying aspect of the One Touch Idol X is the battery, as in a bid to reach a svelte 6.9mm chassis Alcatel has only been able to squeeze a 2000mAh power pack inside the handset. At least at 120g it's not going to weigh you down: the slender body should slide effortlessly into the skinniest of jeans, but if your pockets aren't deep the 140.4mm height may see it peek out the top. However, the lack of bezel - Alcatel describes it as 'zero bezel' but there is a sliver there - either side of the screen means it's not as wide as the competition, which will hopefully lead to a decent grip in the hand. 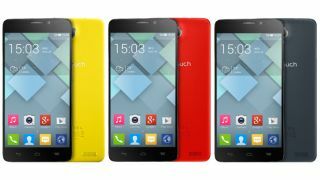 The Alcatel One Touch Idol X will be arriving in the UK soon, but price and exact release date are yet to be announced.